Lately I've been attending lots of meetings. It seems as though everyone wants to introduce me to someone they know that has something to do with ramen. It's pretty awesome. What wasn't very awesome was this Hiyashi Italian Ramen from Due Italian (黄金の塩らぁ麺 due Italian市ヶ谷店) in Ichigaya. On my way home I decided to calm my nerves and observe a legend. Ahh the power of ET. At 1am my time, it was time to connect with the Jane Addams Hull-House Museum in Chicago. 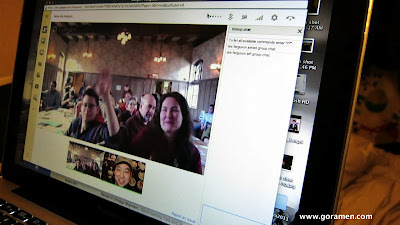 For an event called Re-Thinking Soup--my first Q&A session via video conference. What a success!!! Thanks to everyone who attended!!! And a big shoutout to Sun Noodle, Lisa Lee, Chef Johnny Clark, and the rest of the Hull-House staff!! Great job!!! Should I change my posting style?